Here's another super buy! 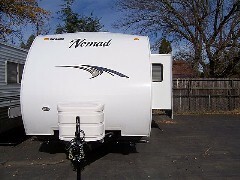 It's loaded with options including new flat screen TV/DVD with inside/outside mounting. Other upgrades this year are new vinyl tile-like flooring as well as tile-like tub/shower surround with the added touch of a shower valence. Ducted A/C & Furnace, stove with full oven & microwave. The Bath has a shower and tub, dinette makes into a bed for two and there's a sofa bed on a slide out as well. In addition to this is are the two rear comfy chairs surrounded by panoramic windows on all sides. The queen bed has his and her's wardrobs and the floor is carpeted. 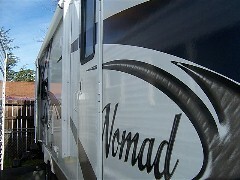 Also equipped with a mounted & covered spare tire, TV antenna with power booster, plug in for cable TV, outside water bib, outside shower, 14' awning and two 30# LPG tanks (filled).